Hello sweet blogging friends. Happy Sunday. I have a little giveaway and also some new projects in the works and an update. While minding my own business and perusing Etsy one evening I came across something just too adorable to pass up. These sweet little dryer balls. I can't stand how cute they are. So I bought some!!!!! This sweet and talented seller lives in the United Kingdom and uses 100% wool to make these. 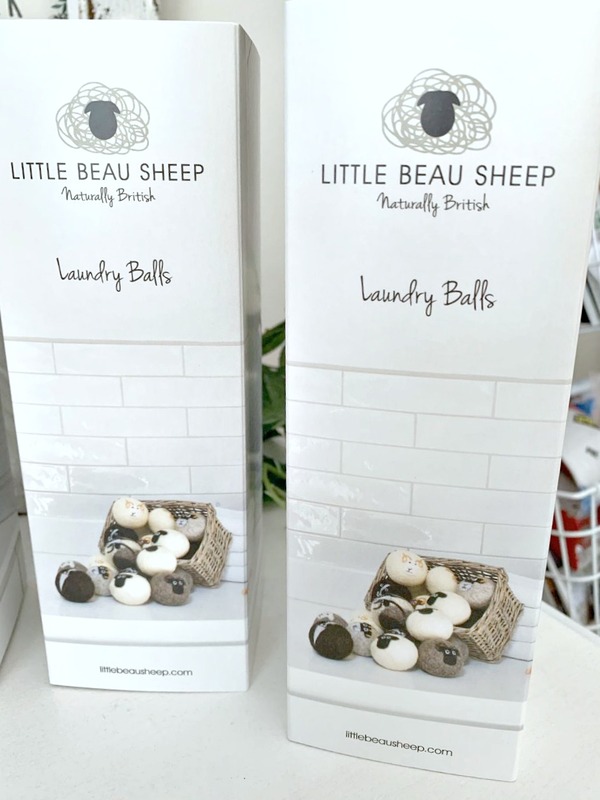 LITTLE BEAU SHEEP 100% wool dryer balls help soften clothes naturally, increasing fluffiness as the dryer tumbles, eliminating the need for fabric softeners or dryer sheets. They are also much quieter and more environmentally friendly than the plastic alternatives. Just pop all three balls into the dryer for a small load of laundry. Or for larger, more heavy duty loads I'd recommend six or more. These felted laundry balls will last for 1,000's of loads. 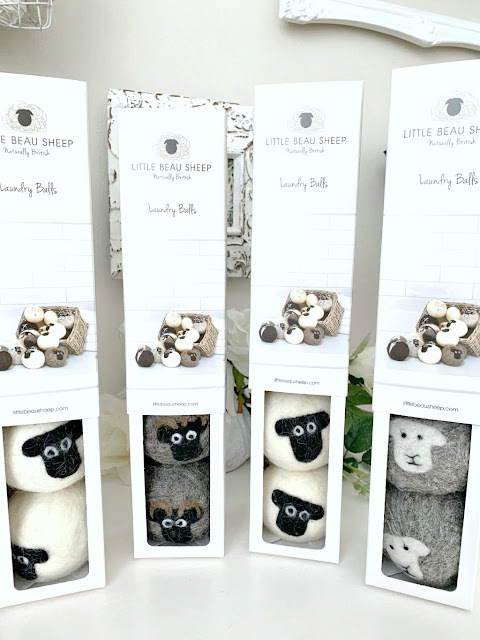 Each pack of 3 sheep dryer balls are made with 100g of natural, undyed wool. They are 100% wool roving to the core with no fillers and not made from wrapped yarn so they can't unravel. They may pill slightly over time with use but this will not affect their performance and you can just trim this off to keep them looking beautiful! This sweet shop can be found here on Etsy. Her Shop Name is Little Beau Sheep! This sweet and talented seller did not compensate me in anyway to give her this shout out on my blog. 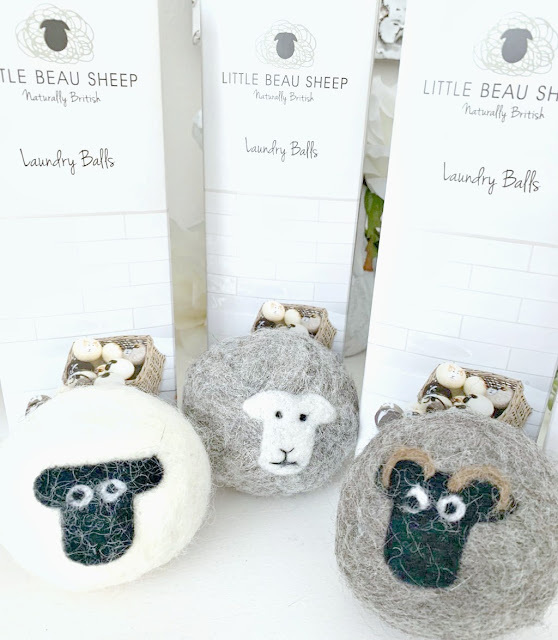 I just love to buy from small business and give them a shout out here on my blog when they make something as special as these dryer balls. They come in sets of three to a box. Very nice packaging if you want to give these for a gift. Look at those adorable faces. Could not pass these up. This seller also makes wool soap and oils to put on the dryer balls too. The idea is to get rid of dryer sheets and chemicals to dry our clothes. I have to say I still love my Downey and Snuggle smells with my laundry. So I cheat the enviorment a little bit and spray my dryer balls with a little fabric softner. These really work so well. My laundry does come out very soft. These little guys hold there shape too. She says you can get over 1,000 dryer loads out of these cuties! Since I was such a Shopaholic and could not resist buying some of these. I am going to do a small give away of a few of these. I wrapped them up in cello and tied them off. They are ready to be sent to a few of you lucky readers of my blog. Hmmmm what might Terry and Kris have up their DIY sleeves for this piece? This is a storage shelf from Ikea. Very inexpensive $35. This my friends is going to be converted to a banquette for the corner where the round dining table will go in the new Living Room / Dining Room make over. This is an example of a banquette that Ballards Design's Sells. They are very expensive if you buy them pre made. They are very efficient for giving you seating in a small space. Terry and his handy tools will convert the inexpensive Ikea pieces into the frame for the banquette. I hope to find some pretty fabric and make the back and seats for this piece. I have had this office chair for a 100 years!!!! Ok maybe 5 years! Seems like a 100 with the wear and tear it has taken. I really love the chair so I did not want to replace it with a new chair. It is broken in nicely for comfort and chippy just the way I like!!! I decided to tear off the old and used fabric and low and behold the padding underneath is still good. 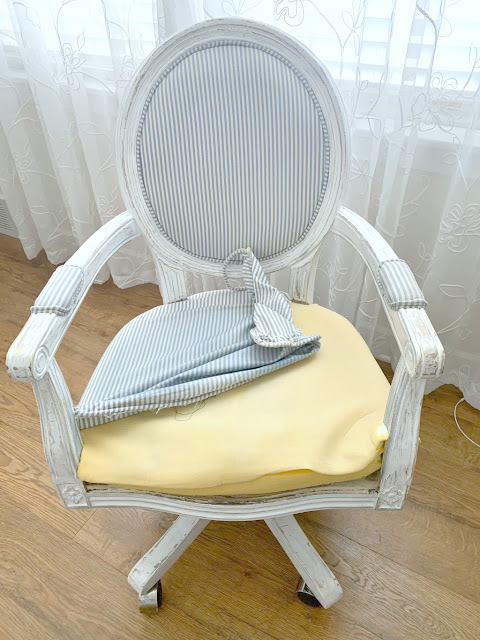 I will go out today and see what kind of fabric I can find to make this chair pretty again. to put the pads back in place. Then finish off the piece around the edges with some piping. Since I do not sew I hope this plan will all work. I will hopefully, fingers crossed and not glued to each other, have a nice finished chair to show you. I am not even going to whine about our low temps and snow snow snow. It is what it is!!! No surprise this is happening here in the midwest. Makes me think though I need to be a southern girl and not a northern girl!!!! These winter DIY's help me through the winter months. I have some early spring cleaning of closets to start while the weather is crappy too. Just would rather have fun creating some new pieces. Hi I just found your blog in the Fall and have become addicted to it and to your blogging friends on the sidelines. Christmas was such a joy to see all the decorating. I am a decorating person and found such great ideas. You better hold on to your husband Terry. He is a master with his woodworking ideas. You make a good pair. I was a midwestener until this summer and after 20 years as a snowbird, sold our home and moved completely to our Florida home. I still have a son & daughter in Inverness so have ties up there still. I have dryer balls already and use them. They do soften nicely. Mine are not nearly as cute as yours are...only YOU would find sheep balls. lol My uncle had sheep and his hands even in his 70s looked like baby hands because of all the lanolin in sheep's wool. I used to love to watch him shear the sheep in the Spring. Can't wait to see your banquet. Mindy did the same thing (using Ikea cabinets) in her house in Milwaukee because of her limited eating space. It worked out great. Those dryer ball sheep are so cute! I love the idea of a banquet. I am looking forward to seeing your new creation! Those dryer balls are sooooo cute! I am still using liquid fabric softener, I just love how it smells. How clever you are to come up with banquet seating as a solution for your small space!!!! I cannot wait to see how it turns out!!!! Love your office chair and cannot wait to see the new fabric for that too. You two are a couple of busy little bees!!!! Have a great week! Those dryer balls are adorable! I am a fragrance-free person so they really captured my attention. I enjoy following your blog. I love dryer balls...and those are adorable! You are doing some fun projects, Kris! What a great idea to use the bookcase as a banquette! I would never have thought about that! Bless your heart if you have to pull out that dang glue gun!!! Be careful, that thing is dangerous! :-) Oh, I cannot wait to see the chair when you get it finished! I love those dryer balls! Those are too cute! I've never tried them because I didn't know how well they would work! And how creative to turn the shelf into a banquette! I'm so excited for you!!! Love and hugs sweet friend! Great thinking for the banquet. We made a bench many years ago out of a bookcase when were first married. Your brains never stop thinking and planning. Can't wait to see it finished. You will get alot of seating without taking up space. Those dryer balls are SO cute! I have just plain ones - not so pretty, lol. But at least they do the job and like you said, with no chemicals that the dryer sheets and other fabric softeners have. I have an idea for you - instead of spraying your dryer balls with the fabric softener just for the smell, why not sprinkle them with an essential oil? I sprinkle lavender oil on mine, but you could do whatever scent of essential oil that you prefer. Oh, I absolutely can't wait to see how Terry makes a banquette out of that bookcase! That man is so talented!! Those dryer balls are so cute, they put a smile on my face. OK, that banquette. Brilliant idea and now you have us all on the edge of our desk seats as we look into your computers and connect with you. This is gonna be GOOOOOOOOD! I love these sheep! 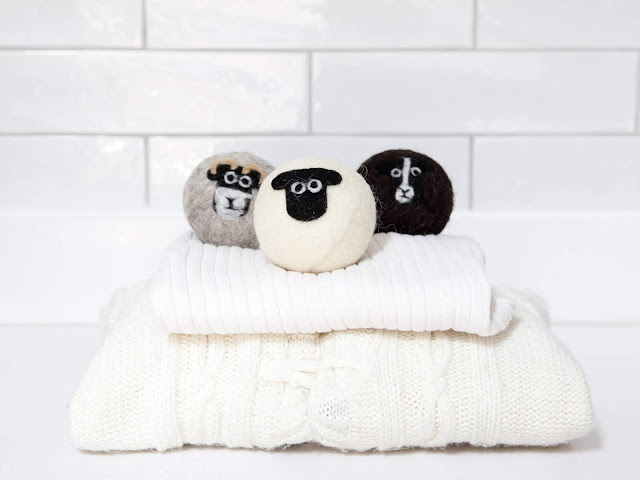 Have been using regular wool balls for some time now - but would love to win one of these cuties! How can I enter to win one?? Just leaving a comment is enough. I will need your email if you win so I can contact you. How adorable! I would not be able to put something so cute in the dryer. But then, I don't really have a dryer as such. Good for you on the kitchen banquette. I have an entire Pinterest board on kitchen banquettes. A wonderful way to use a small space. I'd love to have one myself. But I don't have a Terry! 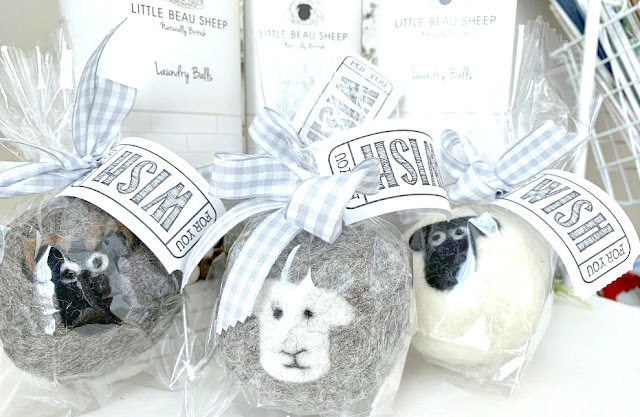 The sheep dryer balls are super cute and so much better than all the chemical stuff. I'm sure Terry will turn the shelf into a wonderful banquette and the chair will look lovely again when you're finished with it. Oh goodness those are adorable. I've just started using dryer balls and love them. Can't wait to see the banquette! I saw those dryer balls on Instagram and thought they were absolutely adorable. Of course Terry will create something amazing from the IKEA piece - can't wait to see what he does. Checking in with you from Montana! Job transfer and settling into a modern farmhouse style home. LOVE these little dryer balls, my daughter has always used tennis balls and they are so loud. 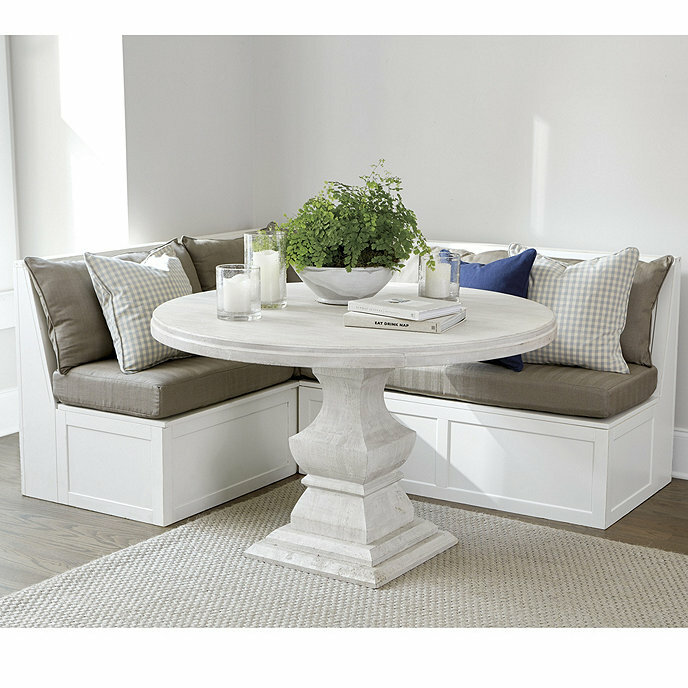 LOVE the banquette idea and can't wait to see Terry work his magic for you! Take care. Kris, those are absolutely the cutest sheep dryer balls I've ever seen! You are such a sweetheart to share this great shop with us, thank you! 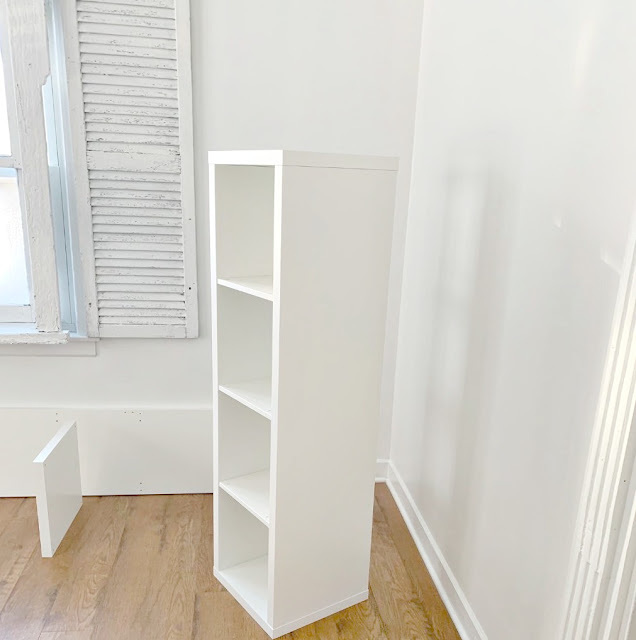 Okay, what a clever thing to do with that Ikea piece! That's just really mind boggling that you Terry can do that. I'm just an all thumbs type! I do try though. I love projects, they just never seem to come out looking wonderful...not even close! Your chair makeover, oh I can't wait to see what kind of fabric you'll pick out. I'm sure it'll be gorgeous! Stay warm sweet friend, warm hugs from Texas. Hi Kris, I never even thought to use dry balls. What a great idea and I bet they work out great with doing the laundry. I am such a laundry freak (taken after my mom) and do laundry all the time! I can't wait to see how pretty you seating nook comes out (yes it is expensive for Ballard Design!). The chair I know will be beautiful. How great you two work as a team. Stay warm and cozy sweet friend. I also hope you are feeling good this week! Hi Kris - these dryer balls are SO cute! I can totally understand why you couldn't resist buying them and I agree that it is good to support small businesses. My husband ran his own business for about 25 years and it is hard work. He used to sell some of my handmade cards for me too and it is such a good feeling when someone buys something that you have made! Really looking forward to seeing Terry's latest make! Oh Gunny Saks! Those sheep are adorable... and I appreciate how you support the small businesses. You and Terry do such an amazing job on these projects. You could probably publish a book with all of your vignette photos and makeover savvy. I hope you're staying warm. Those temps sound dangerously low! Oh my goodness, Kris, those dryer balls are just too cute! I would have to display them when not in use. 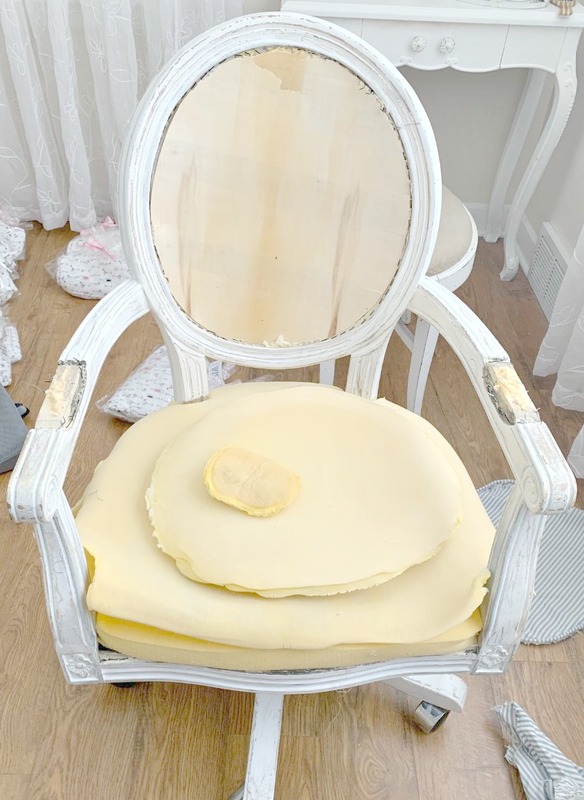 Hm, what will you cover your pretty chair with? And a banquette...that's a great idea! Stay warm and maybe you need to move to Texas! Those little dryer sheep are so cute! Love their sweet little faces! Sounds like you have a great plan in making a banquet out of that Ikea piece! Very clever and resourceful! I sure hope spring comes early for you! Seems it's been unusually cold and snowy in many areas this year. Have a great week! Kris, those are absolutely adorable! I don't use dryer sheets, but when I think those would be especially helpful is when you have a load in the dryer that's less than full, and the clothes tend to get all matted & wrinkled, not fluffed. That seems to happen to me pretty frequently. You are so kind to buy for your readers, and help a small business at the same time. The little dryer balls are so adorable! Will be getting some for gifts for sure! Count me in for the drawing and keep the fabulous decorating ideas coming! LOVE your blog and look forward to each post! I love that you share the Small Business's with us. Thank you for the shout outs thru the years. I love Etsy and enjoy seeing new to me shops. OMGosh...I am SO loving those sheep balls. LOL. I have a sheep thing going on in my tiny farmhouse laundry/mud room. A painting of sheep above my washer and dryer and a vintage sheep themed bowl that holds all the things that fall out of my pockets before they get washed. I can barely think about that amazing banquette project you have going on as I am totally consumed by the sheep balls. Shhh,, did I say that out loud? They remind me of old cowboys who used to have a system of castrating sheep. That is a whole post in itself. Please count me in on the sheep ball contest and I will do a post (does bribery work?) about that topic.If I should have the good fortune to win those warm fuzzy, woolly sheep balls please contact me on my blog. Okay.. leaving now with sheep ball dreams stuck in my head. Great post. What a great idea to make a banquet for seating...bonus extra storage within. I have no doubt your chair will come out amazing. Once you get the original staples removed the rest is fairly easy. I have done more chairs than I can count. They are actually a favorite project of mine. I found a chair that I am going to remake for myself. It was sitting out side the dumpster at my local GW, so free. The bottom seat leather has been previously repaired with black duct tape, but other wise the chair is in really good shape and a good quality. Have fun with you fabric choosing. That often is the hardest part for me, well kina. I have a problem with being a fabric hoarder, so I am off the shopping for it until I have utilized most of what I already have. LOL.Can't wait to see it all completed. I have never seen anything such as the wool balls to be used in lieu of fabric softner sheets. Pretty clever and so stinking cute. OH..I am over the moon so excited to win the sheep balls. I am not able to get to your email on your profile page. Can you send me your email on my comment page and i will not post it publicly but will finally have it. I am SO SO low tech. THANKS SO MUCH KRIS. Those are cute as a button! Too cute to throw in the dryer I’m afraid lol.